Mini baja and solar car races...bridge building and robotics competitions. Engineering students are continually putting their knowledge - and competitive spirit - to the test. If you are interested in participating on a student design team, contact the leader of that team (see Student Organizations for contact information). Our student design teams consistently place well in regional and national competitions. The School of Engineering solar car team achieved a new personal best at the 2015 Formula Sun Grand Prix (FSGP) in Austin, Texas. The School’s Black Nova completed 66 laps and covered more than 226 miles, five times more than last year’s total. SIUE was one of 15 universities from the U.S. and Canada that competed July 26-31 at the Circuit of the Americas in Austin. This year’s team consisted of six SIUE students: Zachary Crawford, Preston Steffey, Zack Endsley, Blake Fry, Cody Lynn and Ryan Maitland; and three SIUE alumni: Alex Wolff, Matt Boone and Calvin Walker. The primary drivers were Endsley and Steffey. Serving as advisors to the team were Dr. Andrzej Lozowski, associate professor in the Department of Electrical and Computer Engineering, and Steve Muren, lab manager/instructor in the Department of Electrical and Computer Engineering. Future business leaders and entrepreneurial hopefuls at Southern Illinois University Edwardsville pitched business plans to a panel of enterprise professionals in hopes of winning the fifth annual “TheOther40” competition. The event resembled the hit show “Shark Tank,” in which the creators of seven businesses worked to prove the future success of their start-up. Students’ pitched their plans to a panel of judges, including Larry Heitz, business executive and entrepreneur, and the first person to graduate with a master’s in business administration from SIUE. Jim Pennekamp, executive director of University Park at SIUE, and Tim Whitten, business counselor for Justine Petersen, completed the panel. 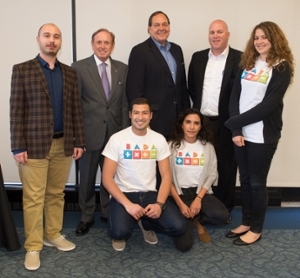 Senior industrial engineering students Anilcan Akay, Alp Yetgin, Damla Gungor and Bahar Sahin won first place and $5,000 for BADA, a two-player brain-builder game aimed at helping the development of math skills and the memory of children ages seven and up. The games creators are from Turkey and are completing the University’s dual-diploma program with Istanbul Technical University. 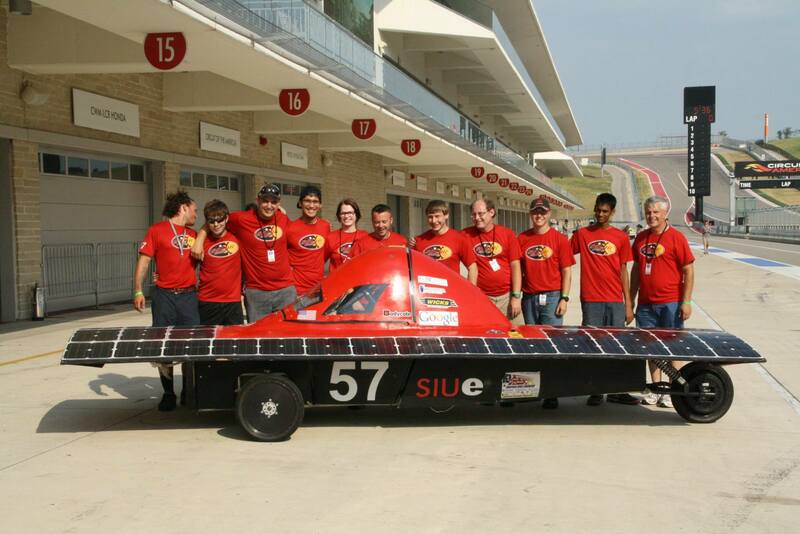 The SIUE Solar Car Team was awarded the Fastest Stop in the Dynamics Brake Test award and placed 13th out of 20 total cars at the 2014 American Solar Challenge Formula Sun Grand Prix race during July in Austin, Texas. 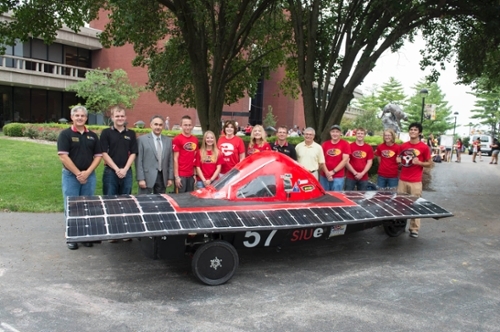 The SIUE Solar Car Team’s goals are to design, build and race solar cars powered entirely by the sun’s energy. The team races against other colleges from the U.S. and from around the world. The organized group enables students from all majors to learn about solar energy, apply hands on knowledge and create a unique project. 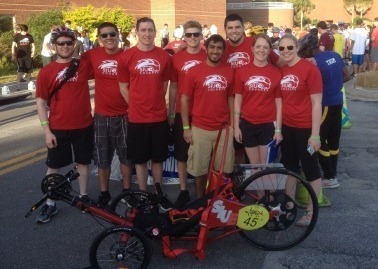 A team of 13 SIUE mechanical engineering students won third place in the endurance category at the American Society of Mechanical Engineers’ Human Powered Vehicle Challenge April 11-13 in Orlando, Fla.
More than 30 teams vied in the international competition. SIUE’s finished product–a three-wheeled, steel-framed, recumbent vehicle–was the culmination of two semesters’ worth of work, according to mechanical engineering senior Terrence Brown. Dr. Soondo Kweon, assistant professor in the Department of Mechanical and Industrial Engineering, supervised and led the students as their faculty advisor. To compete in the endurance category, teams’ self-engineered vehicles had to complete as many laps as possible within 2.5 hours on a two-lane obstacle course replete with hairpin turns, rumble strips and more. Six team members took turns as drivers. Mere days before the competition when SIUE team members were already in Orlando prepping for their event, they had to cope with an unanticipated malfunction. Senior Hayden Sievers said staying the course, especially in light of the gearshift mishap, made him proud to be a part of the team and to win third place in the endurance category. Six SIUE School of Engineering construction management students successfully competed at the American Concrete Institute (ACI) Spring 2014 Convention in Reno, Nev., on March 27. The SIUE team finished fourth in the Concrete Bowling Ball competition and 11th overall. SIUE competed against 31 teams from Canada, Ecuador, Mexico, Puerto Rico and the U.S. Each team entered bowling balls made of concrete. The balls were evaluated on the mass and diameter, as well as toughness, deformation and bowling performance. In addition to their strong performance in competition, the SIUE ACI chapter accepted the 2013 Excellent University Award, the highest award for ACI Student Chapters. The chapter earned the award for its outstanding student and faculty involvement in ACI committees, meetings, events and community outreach. “The SIUE ACI chapter continues to demonstrate excellent teamwork and performance in international competition,” said Dr. Chris Gordon, School of Engineering associate dean and chair of the Department of Construction. “Dr. Anne Werner and the ACI leadership team have a clear passion for concrete. 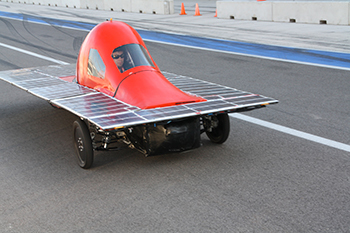 The SIUE Solar Car Team joined 11 other teams at the University of Texas at Austin from June 24-29 to complete in the American Solar Challenge Formula Sun Grand Prix (FSGP). The FSGP is a biannual track race that is held on grand prix or road style closed courses. This unique style of solar car racing is open to teams from around the world and tests the limits of the vehicles in handling curves, braking and acceleration. Driver training, passing strategy and quick pit stops are crucial for teams racing in FSGP. SIUE’s team finished eighth by completing 10 laps after enduring high temperatures of 108 degrees and track temperatures exceeding 140 degrees. They also claimed the Spirit of the Event Award for their persistence and dedication throughout the event. Each team had to ensure that their car met a variety of structural, electrical, mechanical and functional standards before passing “scrutineering” and being allowed on the track. Although the teams were competing against one another on the track, they were extremely collegial off the track. 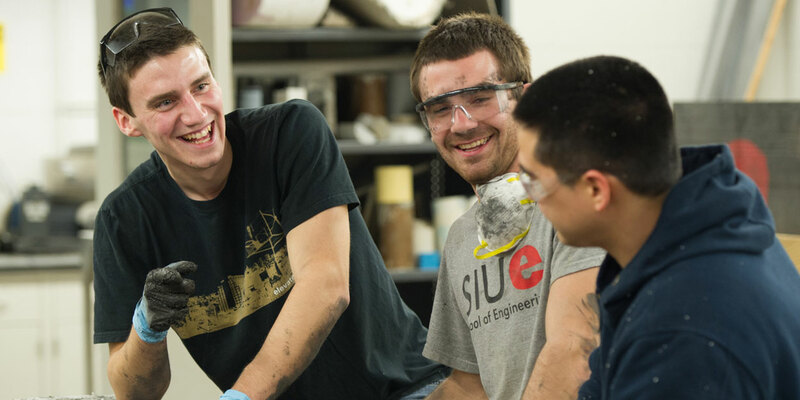 More than 300 civil engineering students and faculty from 15 Midwest universities traveled to SIUE To put their engineering knowledge - and competitive spirit - to the test. The SIUE student chapter of the American Society of Civil Engineers (ASCE) hosted the Mid-Continent Student Conference in April. "The many competitive activities provide numerous opportunities for the students to put into practice what they learn in the classroom," said Brent Vaughn, laboratory specialist and lecturer in the School of Engineering, and the faculty advisor to the student ASCE chapter. "They learn about time and cost management, and most importantly learn to work with team members to achieve goals. Many employers look for students who have demonstrated their skills and initiative with these projects." The conference began on Thursday, April 4, with a steel bridge competition. Students erected bridges in a timed event across a hypothetical river following a set of work site rules. Each bridge was then loaded with 2,500 pounds of steel, while key points on the bridge were carefully monitored for deflection. Three events were held on Friday, April 5. A Paper Presentation Competition - Student authors presented and defended their unpublished papers on "Body of Knowledge - Is It Ethical to Associate Credentials with Competency?" A Geo-wall Competition - Students designed and built model mechanically stabilized earth retaining walls using paper reinforcement taped to a poster board wall facing. The goal was to use the least amount of reinforcement to support the retained soil and both vertical and horizontal loads. A Concrete Bowling Competition - Students designed and constructed a concrete bowling ball that was practical, durable and aesthetically pleasing. The event was divided into two parts: bowling ball design and a bowling competition where teams bowled five frames. 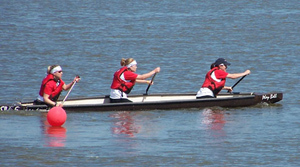 The highlight of the competition was the concrete canoe races held on Saturday, April 6, at the SIUE Cougar Lake Marina. Teams brought concrete canoes that they had designed and fabricated. After being judged on design, surviving the dunk test and a formal oral presentation, teams competed in various races with two, three or four paddlers. The University of Oklahoma took the top spot in this year's concrete canoe competition. The SIUE Concrete Canoe Team won last year's competition, which was held at the University of Nebraska-Lincoln. "This conference gives civil engineering students excellent experience in project management, team building and leadership," says Evan Wilson, chair of the conference and a senior in SIUE's civil engineering program. "The competition teams enable us to develop professionally, personally and academically to become more capable engineers. We also get to work with our hands, along with our minds, to complete some truly unique projects."